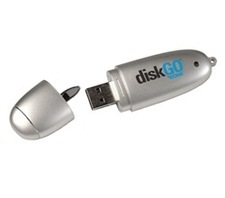 Edge Tech Corp added a new product to its diskGo Series. A Flash Drive with 32 GB Storage space. The flash drive is incredibly small and light-weight. The drive is capable of storing 21000 pictures, 32 hr of video, 8000 songs, or 320,000 documents. The transfer rate of the drive is 480 Mb/sec. The drive comes with a CryptArchiever encryption software which encrypts the data at 128bit AES Conversion. Although this new 32GB flash card is not going to be affordable, approximately $700 USD, I can’t help but to be a amazed by this achievement. Will be released in December. Adorama has the SanDisk 4GB Cruzer Titanium U3 USB Flash Drive for the Bottom Low Price of $49.95 plus $5 for shipping. Cruzer Titanium is an extremely rugged and smart USB flash drive. It is built with Liquidmetal casing that is crush-resistant to over 2,000 lbs. Cruzer Titanium also includes U3 smart technology. Co-Invented by SanDisk, U3 technology gives you the ability to carry your files AND your software on a secure USB drive. You can have your wallpaper, preferences, favorites, profiles, and more - everything you need for a familiar computing experience on any PC, wherever you go.Includes Skype exclusively on all Cruzer Micro and Cruzer Titanium USB flash drives. Make voice and video calls from PC to PC anywhere in the world.Cruzer Titanium allows you to easily store key documents, pictures, music & video clips and transfer them to another computer with a USB port. New retractable USB port eliminates the need for caps and protects your USB connector..
Buy.com has the Seagate FreeAgent Desktop External 500GB Hard Drive for the Bottom Low Price of $179.95 with no tax and free shipping. The FreeAgent 500GB USB 2.0 External Hard Drive from Seagate is a high-capacity drive with an interface that allows it to be connected via USB 2.0 and a rotation speed of 7200 rpm. The drive features a bold design that will look great on your desk while at the same time occupying the same footprint as a standard stapler. It features bus transfer rates of 60 MB/sec using USB 2.0, making the drive is an excellent solution for video editing, high-resolution imaging, data backup or general storage..
Next Warehouse has the Imation 700MB/80-minute 52x White Inkjet Printable CD-R Media for the Bottom Low Price of $37.92 with no tax and free shipping. This 100-pack of white CD-R media offers 700MB of data or 80 minutes of audio storage per disc in up to 52x recording speeds. Since these discs are formatted as write-once media, you benefit from permanent storage that cannot be erased or overwritten and must be finalized before use. Each disc features a premium dye under layer that helps protect against ultraviolet light and provides improved compatibility between your CD-R burner, player or drive. Plus, since these discs are inkjet printable, you can use your compatible inkjet printer to take advantage of this media's featured print surface which extends all the way to the hub, offering you even greater design possibilities..
Next Warehouse has the SimpleTech 4GB Bonzai Pininfarina USB 2.0 Flash Drive for the Bottom Low Price of $54.76 with no tax and free shipping. The sleek lines and ultra-low profile styling of the Bonzai Xpress Flash Drive make you want to show it off, but it easily slides into your pocket for ultimate portability. The stylish lines were designed by Pininfarina, the very same design firm that gives Ferrari sports cars their stylish lines. Features a hi-speed USB 2.0 interface. Plug and play and hot swappable. No external power required.. Circuit City has the SanDisk 2GB Cruzer Micro USB Flash Drive for the Bottom Low Price of $29.99 with free shipping. The Cruzer Micro is an incredibly small USB Flash Drive that lets you easily store your key documents, pictures, music and video clips and transfer them to any other computer with a USB port. With its small, portable, smart design, it fits on any keychain. Plus, the retractable USB port eliminates the need for caps and protects your port. The Cruzer Micro is also U3 Smart enabled and comes pre-loaded with CruzerSync desktop synchronization, SignupShield password manager, SKYPE (for PC to PC video and audio calls) and AVAST antivirus software..
ZipZoomFly has the Western Digital My Book Essential Edition 500GB USB for the Bottom Low Price of $195 with no tax and free shipping. (USB 2.0, 7,200 RPM, 16MB - MPN: WDG1U5000N) Just plug in the 500GB My Book Essential USB 2.0 Hard Drive and you ve got plenty of room to back up and save your valuable data, music, photos, and movies. The elegant case, iconic of a book, takes up less space on your desk, stacks horizontally, and allows two or more drives to nestle neatly together like volumeson a shelf..
ZipZoomFly has the Kingston 2GB Elite Pro Secure Digital Card for the Bottom Low Price of $39.8 with no tax and free shipping. For users who push the edge of the performance envelope to capture the perfect photo series or digital video shoot, Kingston's 2GB Elite Pro Secure Digital (SD) card is the perfect match. This card is built with the same features as standard SD cards, but supports data transfer up to 5 times faster. It features an 8.2MB/s read rate and a 7.7MB/s write rate. It also provides enhanced cryptographic security protection for copyrighted data and can be used in all SD compatible digital devices, including many PDAs, digital cameras, digital camcorders and MP3 players..
Buy.com has the US Modular 4GB QuikDrive 2.0 USB Flash Drive for the Bottom Low Price of 37.15 after $20 rebate (expires 1/14/07) with no tax and free shipping. QuikDrive by US Modular is a portable flash storage drive which allows you to easily store and transfer files via the USB port on any computer. QuikDrive is proudly assembled and packaged in the USA, and is Windows and Mac compatible.Imagine having your Hard Drive from your personal computer with you on the go, and it could fit in the palm of your hand. You could Store, transfer and carry your data with you wherever you go! Once plugged into the USB port, US Modular's QuikDrive is detected by any computer, and recognized as a removable disk. You may start saving/transferring your business or personal data just like your computer's own hard drive. QuikDrive security helps keep confidential data secured. No physical drive or external power supply is needed..